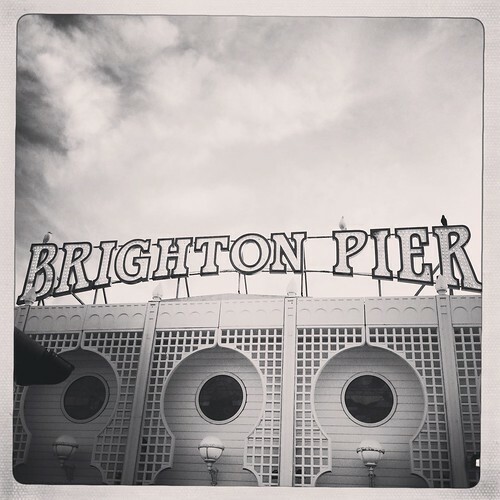 Brighton Pier, a photo by PhotoPuddle on Flickr. Recently I've learned something very important - it's OK to quit things. This might seem obvious to most people but for me I've never felt like I can give up on things without feeling like a quitter. I have found myself in many situations, relationships, jobs, education etc which I know are bad for me or don't make me happy but I've always stuck at things for too long. For some reason recently I've found the courage to step back from a few things that weren't right for me and have stuck at for longer than I should have. Not my marriage by the way - no need to worry hubby if you're reading this! And you know what, it's been fine. In fact it's felt quite freeing. Now I have time and energy to put towards new things - of which I don't know yet - but who knows what the future has in store. Here is a photo I took in Brighton. I could never quit loving Brighton.